The gushing water of Greenland Creek drowned out my footsteps as I trekked through chunky clusters of rhododendron on Mac’s Gap Trail. The lush canopy overhead filtered the tumbling sunlight like stained glass, giving the trail a soft glow. The autumn air was refreshingly crisp, a harbinger of fire pit encircled evenings and the transition to heavier beers. As I hiked out of Panthertown Valley in the slowly fading sunlight, it wasn’t hard to grasp the reason the 6,295-acre swath of the Nantahala National Forest was named for one of North America’s stealthiest predators. While mountain lions no longer prowl the vast expanse of backcountry, Panthertown is still home to animals like black bears, deer, bobcats, coyotes, and hellbenders—gargantuan salamanders, growing to sizes of nearly two feet. Still, as I walked, I imagined the big cats purposefully padding through the knee-high ferns encasing the trail. Back at the Cold Mountain Gap parking lot, the sun a mere slit on the horizon, I took one last look down the shadowy trail. Dubbed the “Yosemite of the East,” Panthertown Valley is a reborn wilderness, punctuated with 4,000-foot summits, plunging gorges, vertiginous granite cliffs, and waterfalls spilling from tannin-tinged trout streams. I’d spent most of the afternoon exploring the massive backcountry tract without seeing a soul—and barely made a dent in the nearly 30-mile network of trails. My first taste of Jackson County, Panthertown Valley was the initial stop on a 3-day excursion, and I was already hooked by the ruggedly gorgeous corner of western North Carolina. As I drove back toward the cozy, mountain-framed town of Sylva that fall evening, I knew that I’d come back to Jackson County as soon as possible. Cozied up to the Great Smoky Mountains National Park and overlaid by the peaks of the Plott Balsam and Great Balsam Mountains, Jackson County is home to a considerable cache of outdoor adventures—perhaps more than any other corner of the state. For summer peak baggers, the county is home to 185 recognized peaks, including a smattering of eight different Southern Appalachian “sixers” (summits over 6,000 feet). Plus, the county is also blanketed by vast swaths of the Nantahala National Forest and the 8,296-acre Ellicott Rock Wilderness, also shared with Georgia and South Carolina. Some of the most iconic, long-distance footpaths in the Southeast thread Jackson County’s wild spaces. Backpackers can pick from options like the 30-mile Art Loeb Trail, which meanders to lofty heights in the Shining Rock Wilderness, stringing together a scenic series of trademark southern Appalachian balds. North Carolina’s most extensive footpath—the 1,175-mile Mountains-to-Sea Trail—also weaves through the county, showcasing high country highlights like the 6,292-foot Waterrock Knob. Plus, just outside Sylva is the 1,100-acre Pinnacle Park. The 7-mile out-and-back haul to the park’s namesake peak at 4,820 feet is a local favorite, with views of the towns of Sylva, Webster, and Cullowhee. Beyond hoofing it over the clouded peaks, there are plenty of ways to mix up the adventure itinerary in Jackson County, and more than enough excuses break out the entire arsenal of gear, from bikes to boats. Rough riders can hit ribbons of singletrack right outside Sylva, like the expertly-crafted 6.7-mile trail system surrounding the campus of Western Carolina University. Meanwhile, road riders can pick from the abundance of scenic byways. A locally-beloved loop nicknamed the Ring of Fire is a particularly challenging 38.2-mile route with 4,700 feet of elevation gain. The Jackson County town of Cashiers also hosts an annual road race called the Tour de Cashiers. This extreme cycling challenge is a route cobbled together from the byways of Jackson, Macon, and Transylvania counties, featuring 25, 62, and 100-mile options and more 10,000 feet of elevation gain. Left your bike at home? Rent one from Motion Makers in Sylva. They require advance reservations, so make sure you call 828-586-6925 or email them (hello.sylva@motionmakers.com) before you go. Jackson County is also a mecca for anglers, as it is home the longest continuous stretch of Mountain Heritage Trout Waters in North Carolina. Dubbed North Carolina’s Fly Fishing Capital, the county has nearly 4,600 miles of fishable streams, annually stocked with nearly 10,000 trout, which is more than anywhere else in the state. The county’s best places to cast are showcased on the 15-stop Western North Carolina Fly Fishing Trail. To date, the largest rainbow trout ever hooked in North Carolina, weighing in at just over 20 pounds, was caught in Jackson County’s Horsepasture River. Be sure to plan some time to get in the water! From bike to boat, flatwater paddlers have their pick of postcard-worthy lakes, like the sprawling Lake Glenville. The lake is the loftiest east of the Mississippi River and offers paddlers 26 miles of shoreline to explore. There are also secluded lagoons of serenity like the 40-acre Tanasee Creek Lake, featuring shorelines shrouded by the Nantahala National Forest, or 183-acre Wolf Lake, a hotspot for brook, brown and rainbow trout. Besides the mottling of mountain lakes, Jackson County is also home to plenty of moving water, including waterways like the Tuckasegee River. Nicknamed the ‘Tuck’, it’s Jackson County’s most conspicuous ribbon of water. 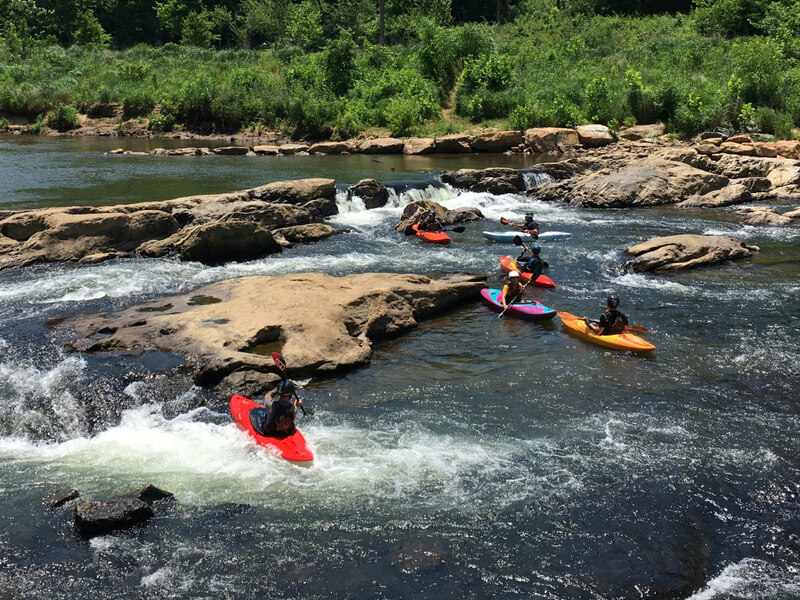 For a few days a year during scheduled releases of the Glenville Dam between April and August, the West Fork of the Tuckasegee below High Falls is transformed into a technical whitewater run, featuring nearly six miles of class IV paddling. At the same time, portions of the Tuck are also exceedingly float-trip-friendly, like the slow moving, class I-II segment between Whittier and Dillsboro. Après adventure, there are also plenty of reasons to stick around, especially when it comes to the Jackson County Ale Trail. Weaving through the town of Sylva, the craft brew laden route currently links two eclectic breweries in a two-minute walk: Innovation Brewing and the Balsam Falls. Later this summer, the ale trail will add Nantahala Brewing. Last week, I kept the promise I’d made to myself leaving Panthertown Valley that evening in early fall. I headed back to Jackson County without my boat or bike, but with my dog. Coonhound in tow, the trip was a reprise of my autumn tour of Jackson County’s 45-mile portion of the Blue Ridge Parkway, which includes some of the loftiest stretches of the entire 469-miles roadway. Our final hike was a ramble through the undulating high country along to the Art Loeb Trail, taking in 6,046-foot Tennent Mountain and 6,214-foot Black Balsam Knob. Standing on the treeless summit of Black Balsam Knob, we had sweeping 360-degree vistas, filled with shadowy blue peaks spreading in every direction. Below me, the Art Loeb Trail traced the spine of a grassy alpine ridge—our route out to the balsam-shaded trailhead. This time, I made a slightly different promise to myself: We’ll come back to Jackson County as soon as possible (and maybe spend a few more nights next time). This just might be the most adventure-filled region in the entire state.